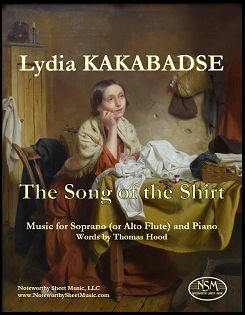 Acclaimed British composer Lydia Kakabadse set to music the words of Thomas Hood's poem "The Song of the Shirt". Just published by Noteworthy Sheet Music, the piece also works beautifully as an instrumental duet for alto flute and piano. SOMERVILLE, Mass. - Aug. 2, 2018 - PRLog -- Noteworthy Sheet Music, LLC (NSM) is an online sheet music publishing enterprise with a catalog of ~170 editions, most of which are unavailable from other sources. NSM specializes in, but is not limited to, sheet music for flute and alto flute. They offer original contemporary works by distinguished American composers, facsimile editions of rare historical scores, and unique transcriptions of pieces from the classical repertoire. Selected NSM publications are offered as professionally-printed hard copy versions, and most of NSM's catalog listings are available as convenient pdf downloads from the NSM website. Acclaimed British composer Lydia Kakabadse set to music the text of Thomas Hood's poem "The Song of the Shirt". Written for soprano and piano, the composition has just been published by NSM; the music is inspired and expressive, and also works beautifully alone as a "song without words" for an instrumental duo of alto flute (in lieu of voice) and piano. The composer writes in her program notes for The Song of the Shirt: "The words, written by Thomas Hood in 1843, depict abject poverty, misery and the cruel exploitation of the poor. They conjure up a picture of a woman in rags, worn out by endlessly sewing in filthy, pitiful conditions, appealing to the consciences of men. Hood's words are very inspirational and both the piano and voice reflect these brutal agonies. The melancholic tone of the words and the monotony of such a wretched existence are characterized by the wide use of minor keys and bare intervals." The Song of the Shirt has been recorded by Clare McCaldin and Christian Wilson and appears on the "Lydia Kakabadse" CD (Naxos 8.572524). Lydia Kakabadse "is a phenomenon and a virtual reincarnation of an earlier music master and her music is impressively singular" (Gapplegate Classical Modern Music). Lydia lives in the UK and writes mainly chamber and choral music. Her works include string quartets, string duet, songs, musical dramas, a cantata, a concert requiem Mass and choral works for mixed choir, male voices and children's choir. A "very gifted and accessible composer" with "a mastery of counterpoint and a richness of ideas" (Music Web International), Lydia's works have been released on CD under the Naxos and Divine Art labels. Her unique compositional style - "brilliant in respect of writing and musical ideas" (Jazz & Tzaz) - features the double harmonic scale (also known as the Arabic scale) and combines open triads and Gothic features with Middle Eastern traits and rich melody. An avid Latin enthusiast and greatly inspired by Mediaeval music, Lydia has written her own texts in Latin for her choral works and also adapted sacred Latin texts. She also draws inspiration from Greek & Russian Orthodox liturgical traditions, Middle Eastern music and poets of the Romantic era. For additional information about The Song of the Shirt, including a free preview page of the score and links to the composer's biography and an audio clip from the recording, go to the NSM listing page at https://www.noteworthysheetmusic.com/sheet-music/ensemble-tags/voice/638-kakabadse-the-song-of-the-shirt-soprano-or-alto-flute-and-piano. The sheet music is available as a downloadable PDF from NSM; the edition includes a part for alto flute in G, complete program notes, and poem text sheet, in addition to the score for soprano and piano. Visit www.NoteworthySheetMusic.com to learn about NSM's other outstanding editions, including Russian Tableaux for string quartet by Lydia Kakabadse. New sheet music selections are uploaded often, along with preview pages, contemporary composer biographies, useful links, reviews and articles.